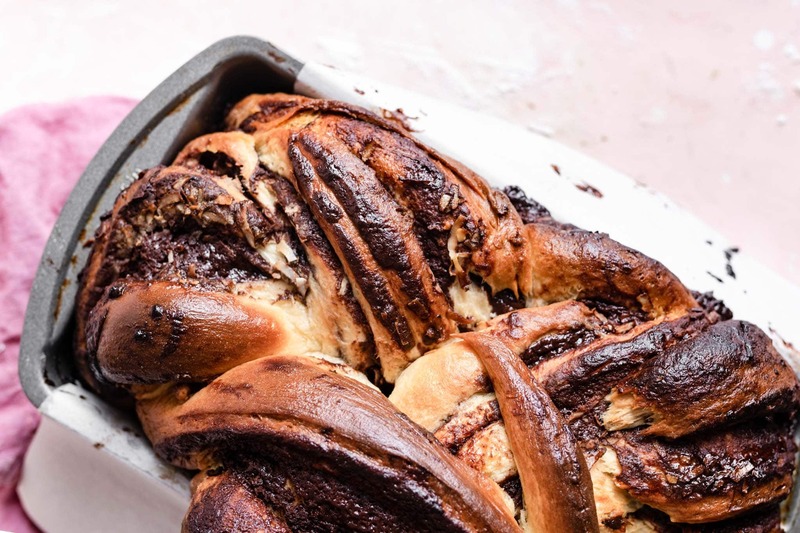 This is the softest, fluffiest Chocolate Babka ever! No, I’m not exaggerating and yes I devoured several slices before writing this post. The combination of chocolate and coconut is one of my all time favorites. I’ve tried them just about every way except for in a bread. 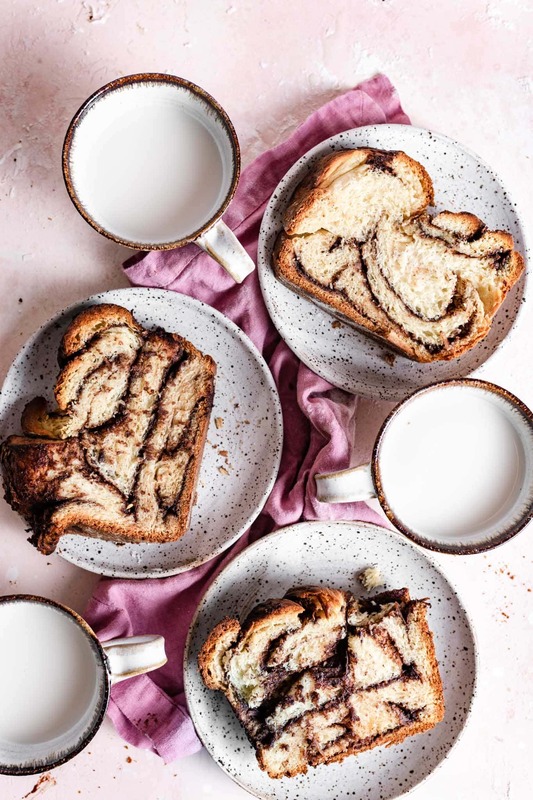 So naturally, when Cocavo asked if I could create a sweet bread using their natural coconut and avocado oil, I immediately thought babka! 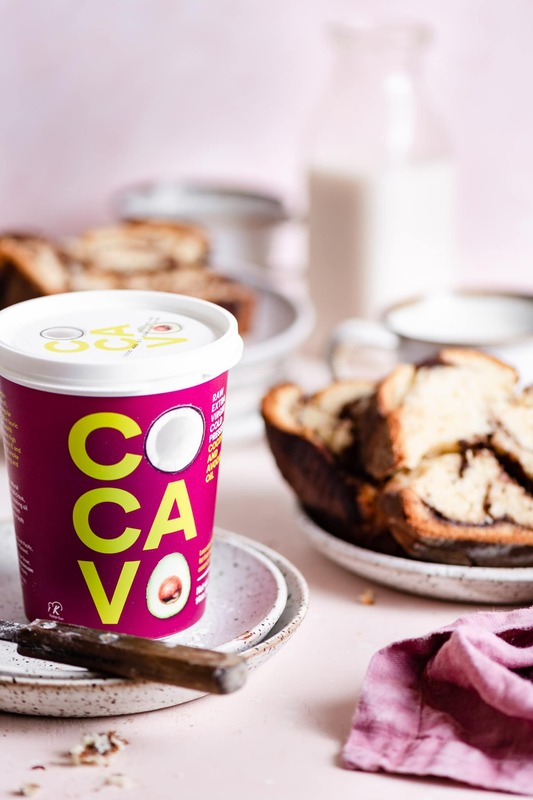 Derived from certified organic ingredients with amazing taste and health benefits, Cocavo is definitely a quality product I want added to my baking. 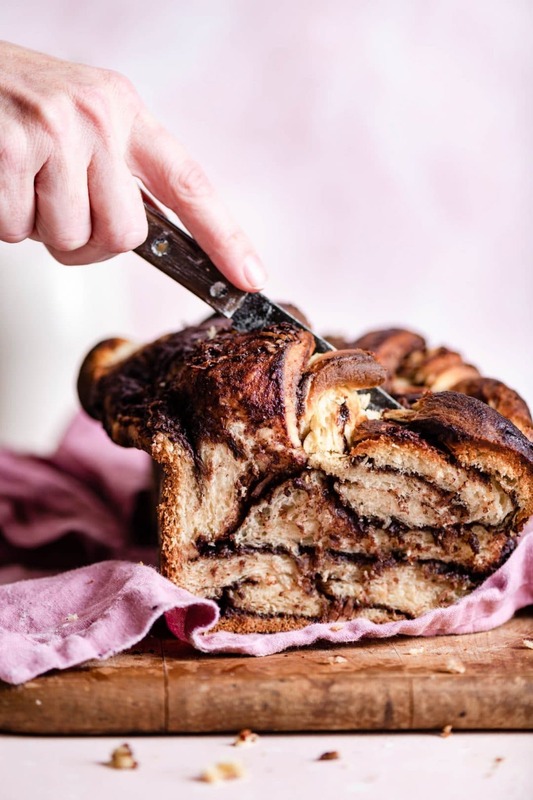 With babka you can mix the Cocavo oil in both the dough and the filling for a punch of coconut flavor. The all natural extra virgin coconut oil and extra virgin avocado oil blend give the dough a silky smooth texture. Bonus for the added creaminess of the chocolate Cocavo fudge filling. Yes, I licked the bowl! Weigh and sift out your flour. Exact gram measurements are far more accurate for making quality dough than just eyeballing your scoop. Since coconut milk often comes separated as solid and liquid in a can. Dump it into a small sauce pan and whisk together as it warms. Measure out the 3/4 Cup you need for this recipe and pour the remaining into a container to store in the fridge. The coconut milk should be warm (110-115 F), not hot! Hot milk will kill your yeast. I use the finger test. Stick your pointer finger in the milk and if its too hot for your finger, its too hot for the yeast! Use room temperature eggs and butter. Melt your Cocavo and let cool. Then measure out a liquid Tablespoon. If you find your dough too be too sticky to the side of the bowl after incorporating the butter, simply add a Tbsp of flour at a time. 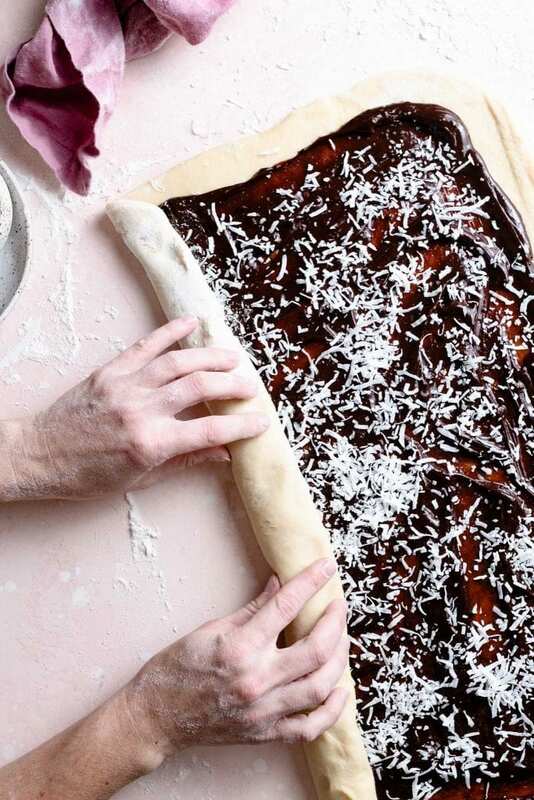 The dough should be soft and tacky, not overly sticky to fingers, and definitely not dry. Let your dough rise (proof) in a warm draft free place. My trick is to set the bowl on the lowest rack of my oven, leaving the oven light on. Works like a charm! It may take 1-2 hrs for dough to double in size. Or you can let it do a long cold prove over night in the fridge. 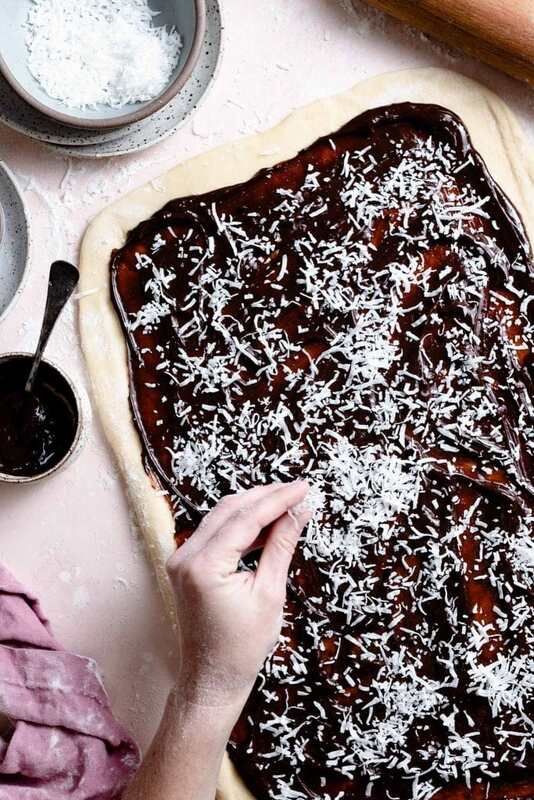 Let the chocolate coconut fudge cool before spreading on your dough. Add a little sea salt to your sprinkle of shredded coconut for added flavor! 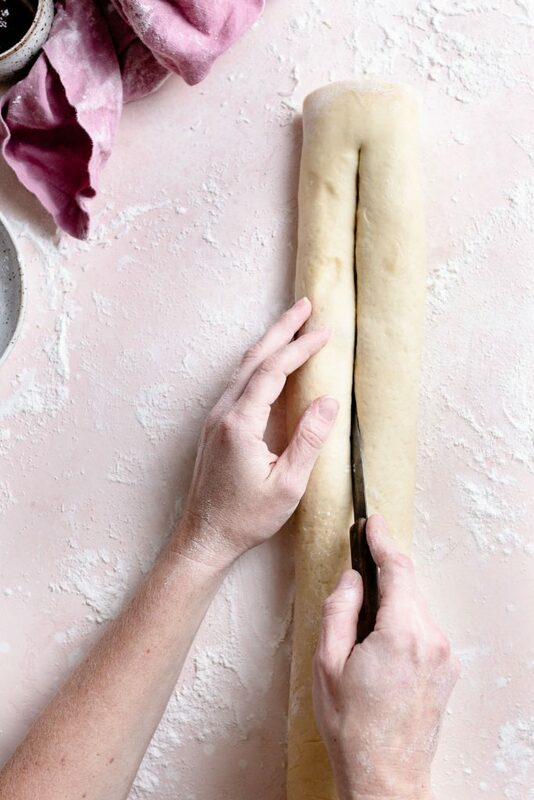 When slicing your rolled dough in half, leave a couple inches uncut at the top. This makes braiding so much easier. Then once your done braiding, cut the end and finish. 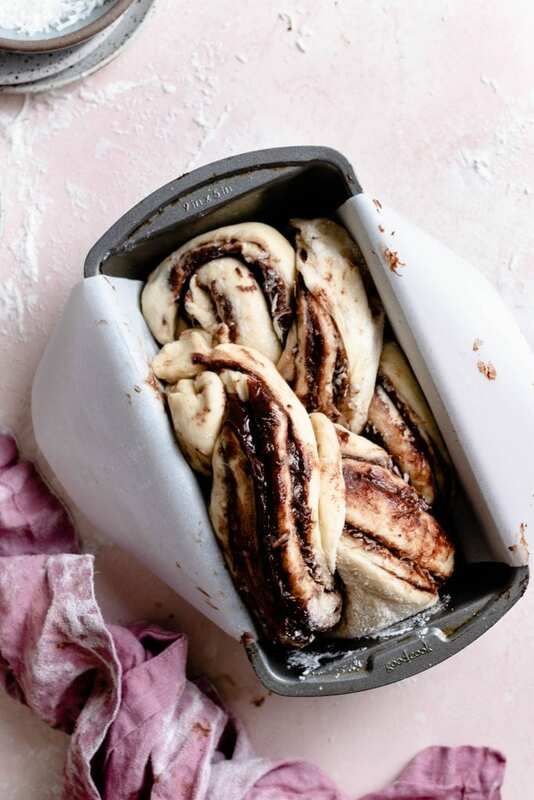 Place your dough in the pan by tucking the ends under. Lift the loaf gently with two hands and lower into pan. For the second proof, simply let it rise under a light or in a warm location. 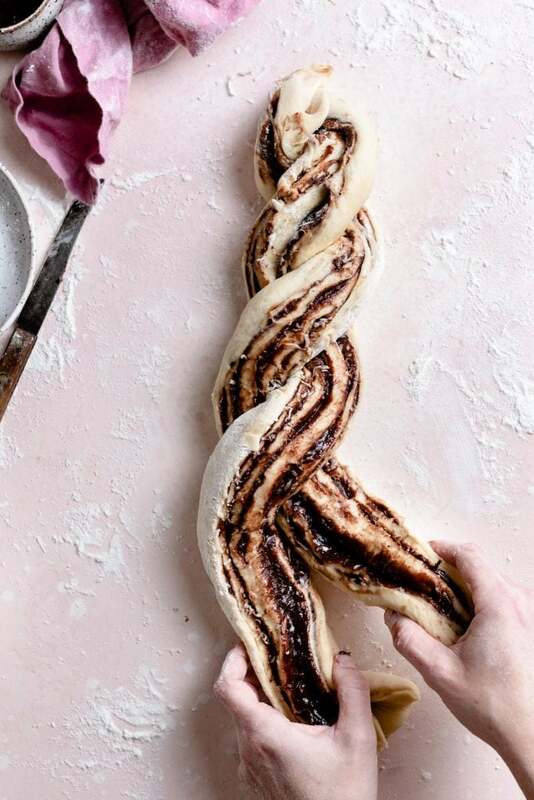 Another tip is to Bake your babka on a lower rack. Finally, check the temperature (190 F) of your baked loaf to ensure its completely done. ~Grab a container of Cocavo at your local Wal-Mart! 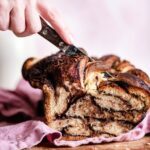 Coconut Chocolate Babka Recipe is Sponsored by Cocavo. All thoughts and text are my own. Thank you for supporting the companies that help make Two Cups Flour possible. 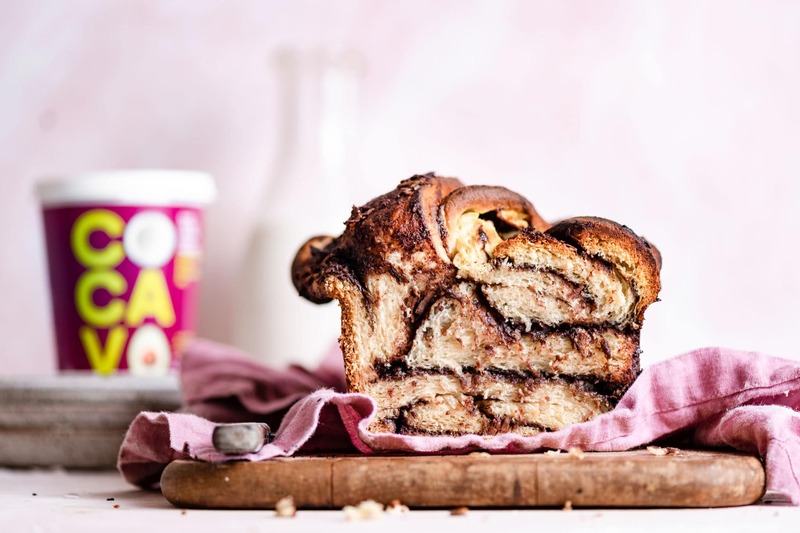 Coconut Chocolate Babka bread made with quality coconut oil. 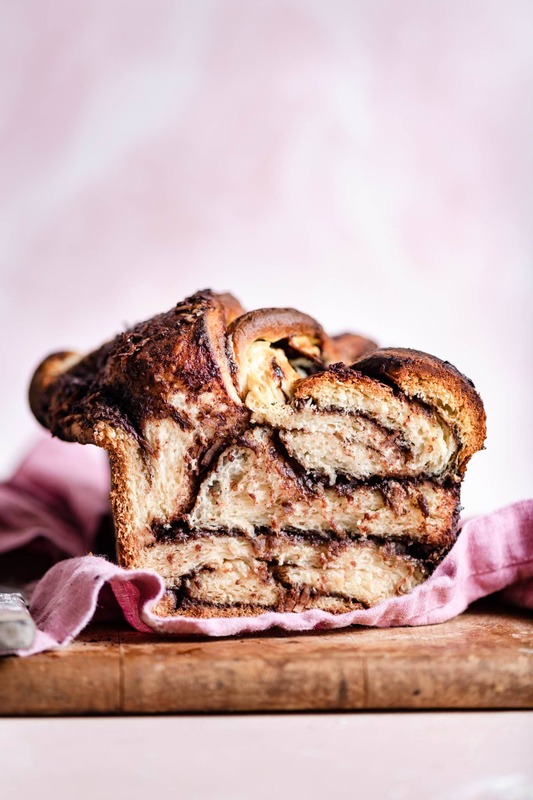 Soft homemade babka bread with a coconut chocolate fudge filling. Add warm coconut milk and yeast to bowl of stand mixer. (give a gentle stir) Let sit for 10 minutes until frothy. Meanwhile weigh and sift flour into a medium bowl. Whisk in salt. Set aside. Add eggs, Cocavo, and sugar to yeast mixture and mix on medium speed with paddle attachment until smooth. Slowly spoon in flour mixture while on medium high speed. You may need to to take a spatula and press down flour from the sides. Once dough has formed, add slices of room temperature butter one at time until thoroughly worked into the dough. Combine all ingredients together in a small saucepan on low heat. 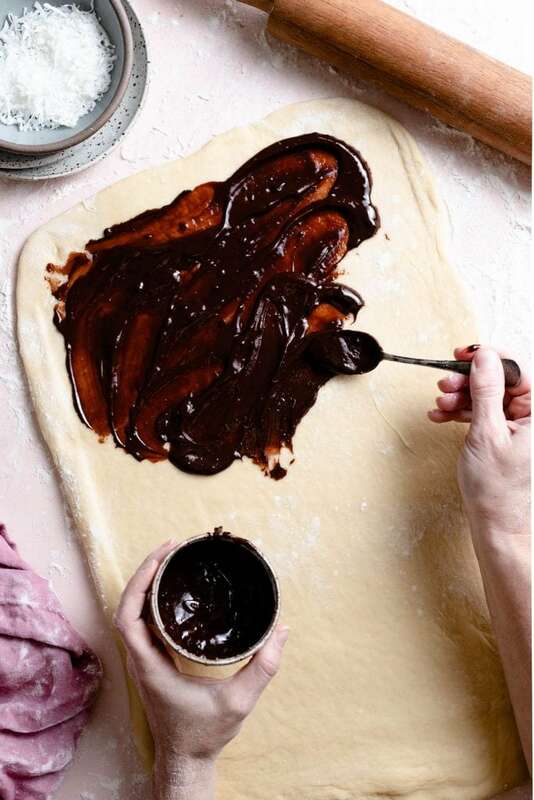 Stir until sugar and chocolate are melted and creamy. Remove from heat and set aside to cool. Can place in fridge until ready to assemble babka. Grease and line 9 x 13 in loaf pan with parchment paper. See photo above for parchment paper. Remove dough from plastic bowl and punch down excess air. 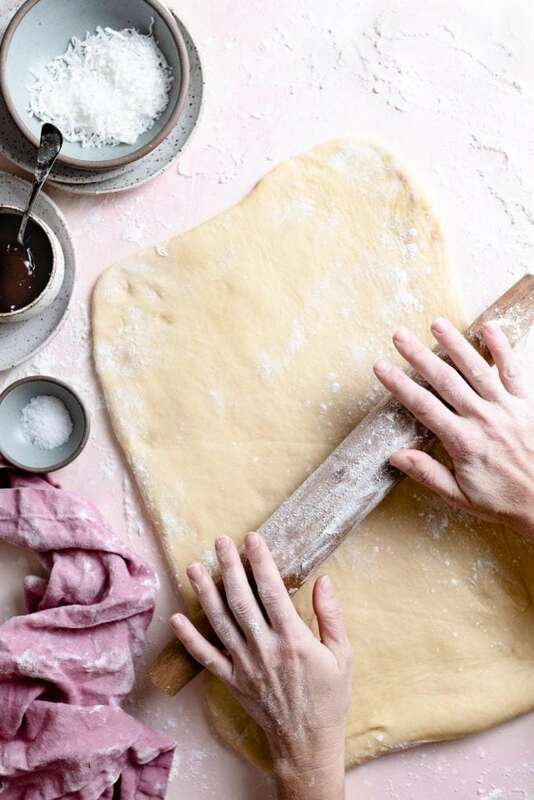 On a lightly floured surface, roll out into a rectangularly shape about the size of a cookie sheet. Spoon even thinnish layer of fudge filling onto dough. Leave a 1.5 inch border around the edges. Sprinkle with coconut flakes and sea salt. 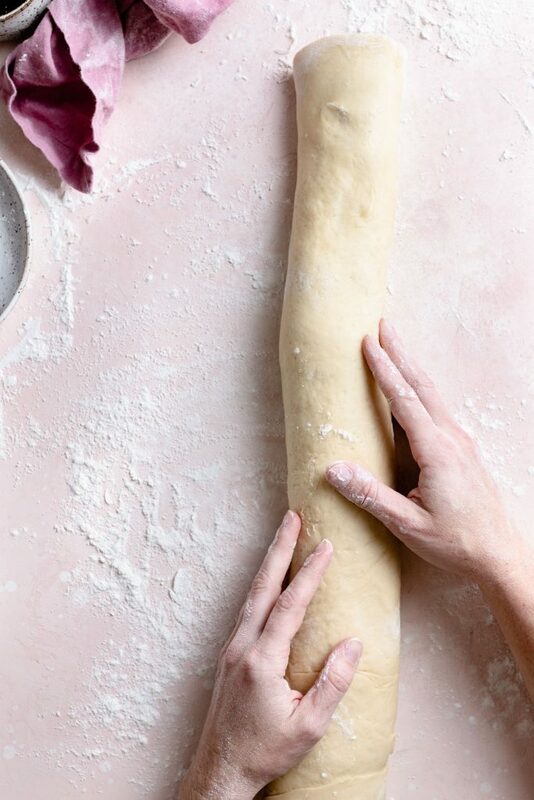 Roll the dough inward lengthwise, tucking as you go. Make sure it is a snug roll and not loose. 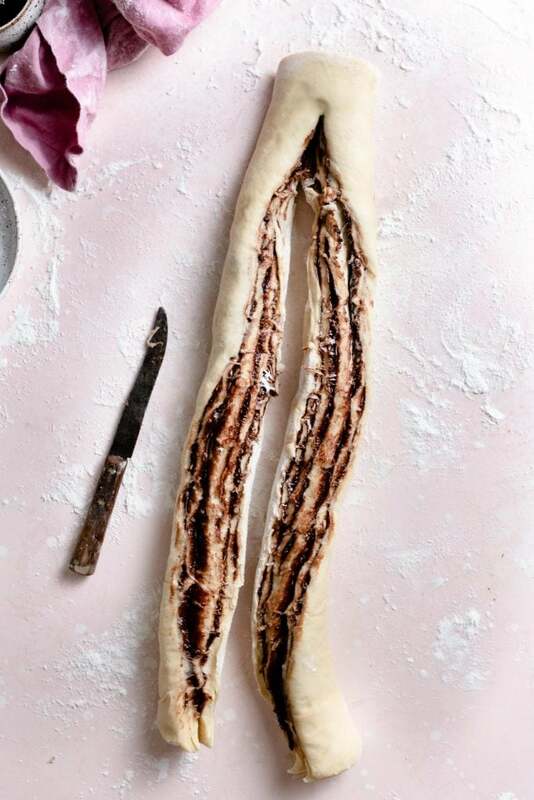 Once rolled take a sharp knife and cut the dough log into two pieces length wise. Rotate the halves upward to expose the filling. 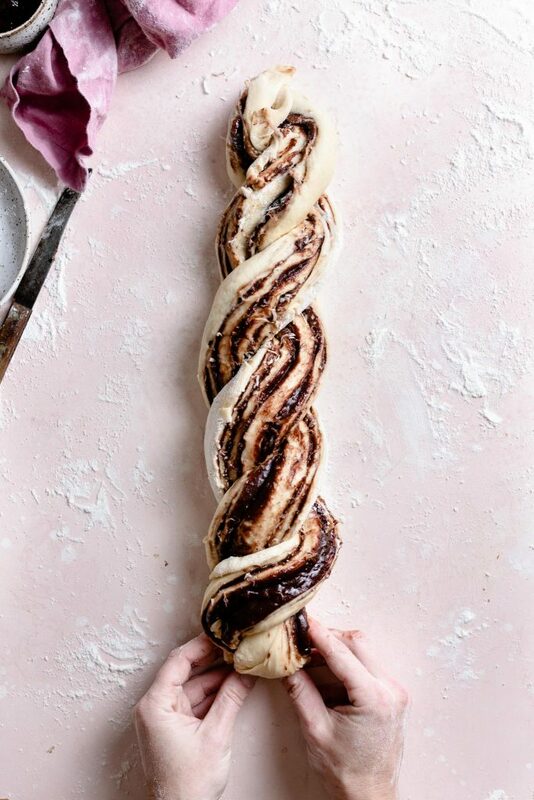 Criss cross the halves down the entire length of dough. Pinch the ends together and tuck underneath. Place pan in a warm draft free place to rise (proof) a second time. (1-2 hrs). 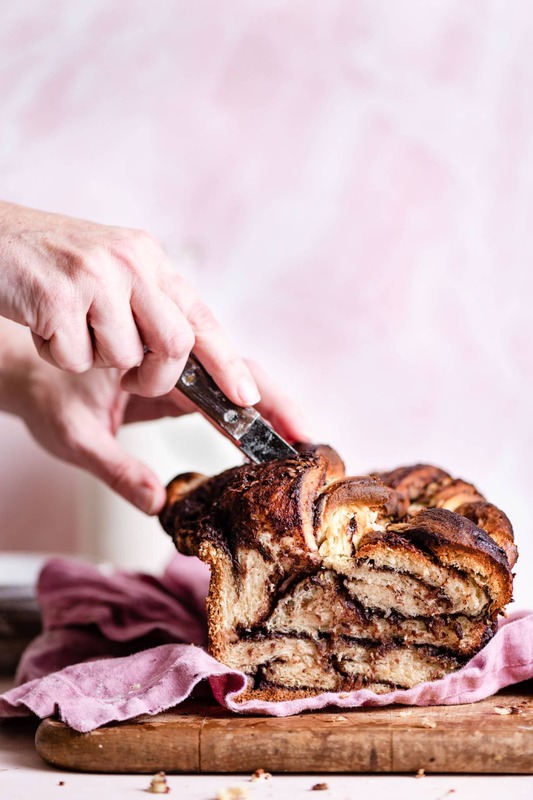 Cover babka with aluminum foil halfway through baking to prevent the top from burning. Once baked set on coming rack for 10 minutes before lifting from pan. Brush with honey and serve!